Sharp XE-A101 Electronic Cash Registers at Cash Register Store. The Sharp XE-A101's are large retail buyback cash registers. We therefore list them as refurbished model cash registers. These cash registers include a NEW factory warranty. The Sharp XE-A101 is an entry level cash register great for kiosks or for anywhere where space is limited. The XE-A101 includes an easy to read LED operator display and a lightweight 4 bill cash drawer. 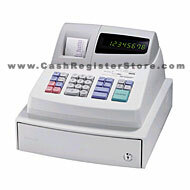 This cash register comes standard with a numeric drum printer utilizing low cost standard 2¼" calculator paper. Featuring 80 plu's, 8 departments, and 4 clerks any small operation can make good use of this lightweight register.